The tragic case of Trayvon Martin — a black teen who was gunned down by a man acting as a “neighborhood watch” volunteer who has yet to be prosecuted — is now a national outrage. Slate’s Emily Bazelon explains that part of the reason why Martin’s killer, George Zimmerman, was not arrested by police is because of the expansive definition of self defense offered by Florida’s “Stand Your Ground” law that it passed in 2005. This law authorizes Floridans to use deadly force if they even think they are in danger, which is the justification that Zimmerman offered. Florida Senator Durell Peadon, an ALEC member, introduced the law in his state and it passed in early 2005; the NRA was behind the bill and its lobbyist Marion Hammer reportedly “stared down legislators as they voted.” After Governor Jeb Bush signed it into law, Hammer presented the bill to ALEC’s Criminal Justice Task Force (now known as the Public Safety and Elections Task Force) months later. As the Center for Media and Democracy has uncovered, the NRA boasted that “[h]er talk was well-received,” and the corporations and state legislators on the Task Force voted unanimously to approve the bill as an ALEC model. As CMD and Common Cause have noted, ALEC Task Force meetings are closed to the press and public, but corporations and ideological special interests or trade groups like the NRA vote as equals with elected officials. At the time, as CMD has documented, Wal-Mart was the corporate co-chair of the Task Force. 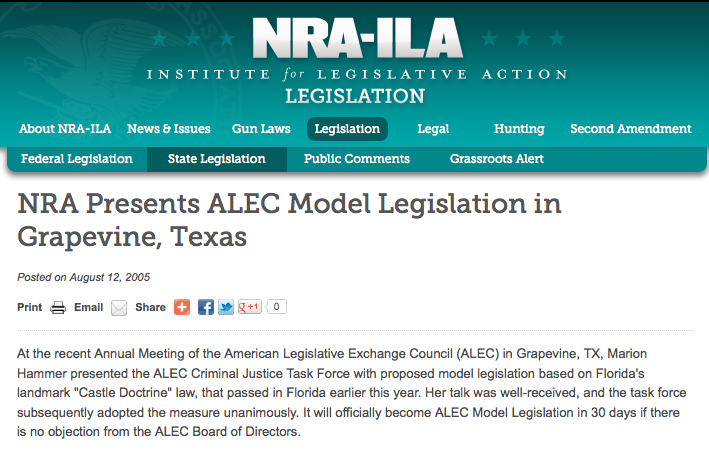 Since becoming an ALEC model, 16 states have passed laws that contain provisions identical or similar to the ALEC “Castle Doctrine Act.” In 2007 it was passed in four states and highlighted by ALEC on their “legislative scorecard,” as discovered by Common Cause. For what it’s worth, one of the authors of the 2005 law has argued that it should not be used to protect Zimmerman and the circumstances mean that it does not apply. Yet as the judicial system goes to work on examining the case, NRA and ALEC’s pet law may deny Martin justice.